Lepidospartum squamatum (Tetradymia squamata A. Gray 1874) A. Gray 1883. Scale broom, broom scale. 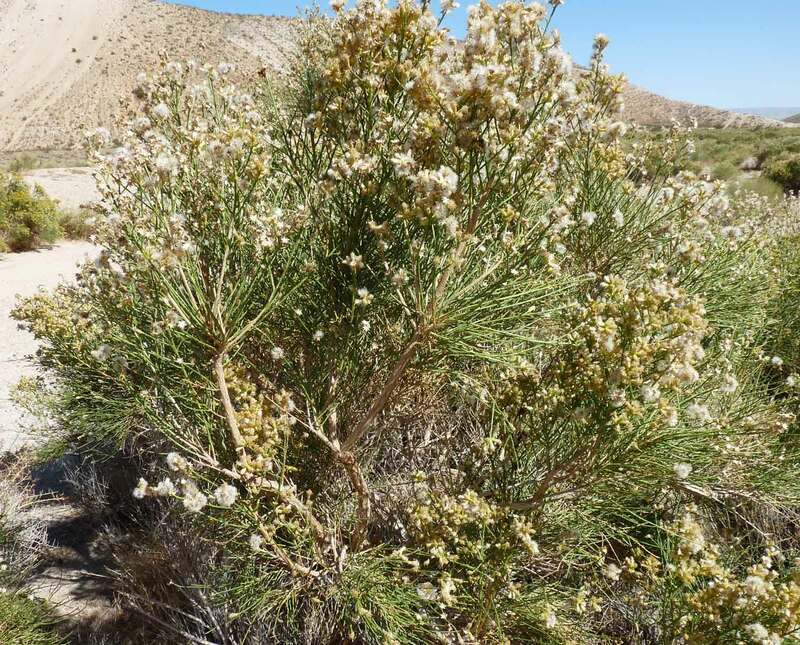 Small to large much-branched shrubs with green scale-leaved stems to 3 m high, often appearing in clones to 3 m broad, habit much like rabbitbrush or broom baccharis (Baccharis sarathroides); leaves alternate, of two kinds, young leaves spoon-shaped densely covered with whitish downy hairs, 5–20 mm, soon deciduous, those on upper green stems scale-like, closely pressed to the stem, 1–4 mm long. 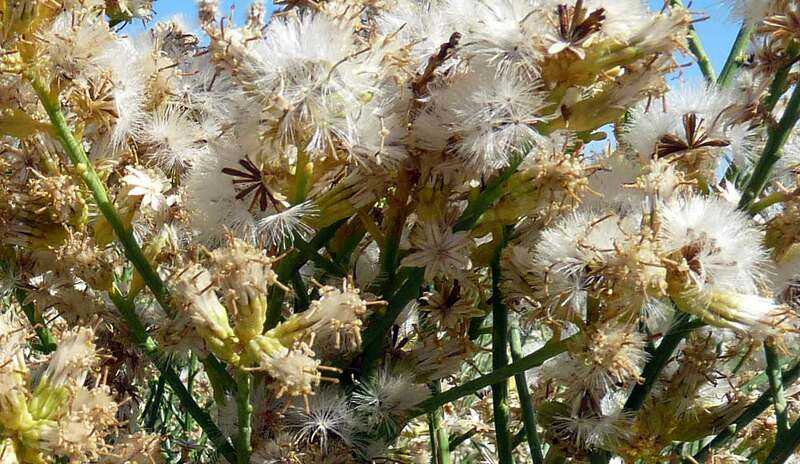 Flowering Aug–Dec; flower heads in short narrow racemes near the ends of branchlets, short cylindric, with 9–13 (-17) yellow disk flowers, the styles exserted; involucral bracts in 3–4 graduated series, boat-shaped, erect in flower, spreading widely in fruit, the lowermost persistent past fruit; cypselae with a stake-like pericarpium, the pericarpium brown, 10-ribbed, 3.5–5 mm, and with terminal off-white capillary bristles 5–8 mm. 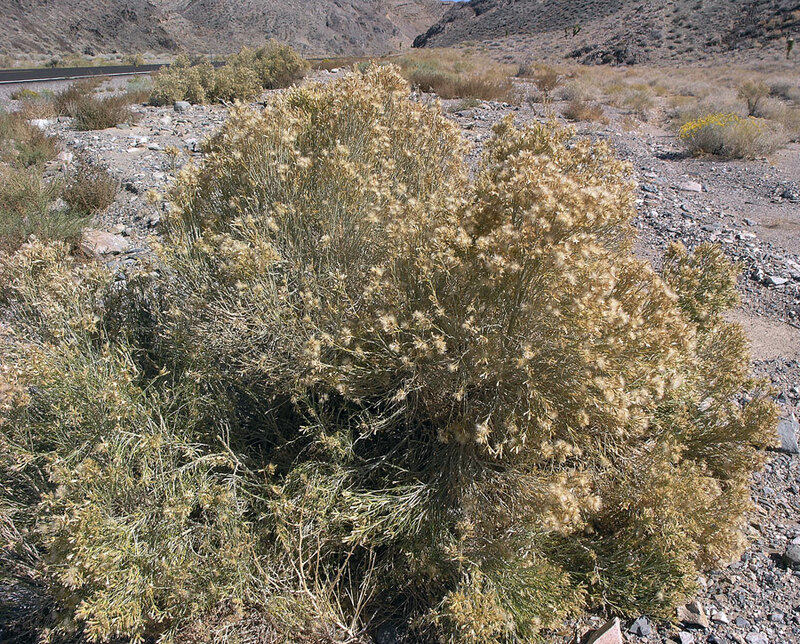 Locally abundant and dense in some washes below 5,000 ft, appearing to be somewhat invasive, possibly spread by off-road vehicle recreation; Inner South Coast Ranges, southern Sierra Nevada, Transverse Ranges, western Mojave and Sonoran Deserts south to the Vizcaíno Peninsula in Baja California. 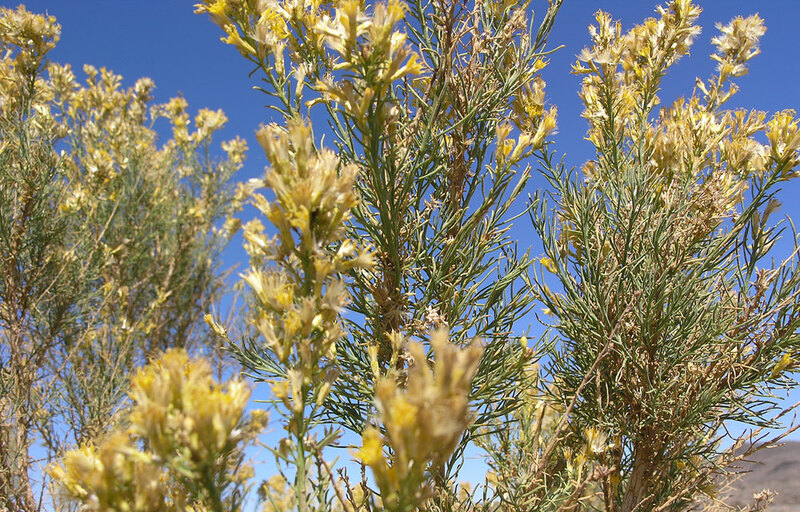 Scale broom scrub recognized in MCV2 when >1% cover. Type from “Low hills of the Sierra Santa Monica, Los Angeles” Co., CA. Kern Co.: “Common in washes, canyon bottom, sandy disturbed places (such as old quarries and sand pits), etc., in the desert and the lower elevations of the mountains southwest to Cuyama Valley. Scarce in the valley and very rare in the northern Temblor Range” (Twisselmann). 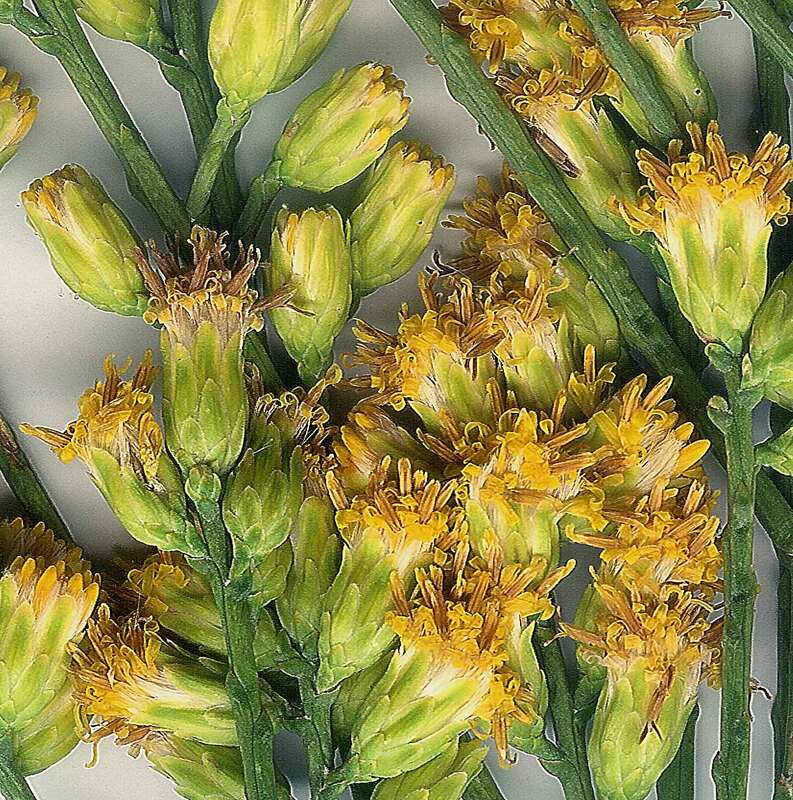 Broom scale migrates freely and often appears promptly at freshly graded areas, road construction cuts and fills, etc., frequently in places some distance from possible parental colonies” (Twisselmann), 100–1,563 m (CCH).